PCBminions is specialized in quick turn fabrication. Design 2-layer boards with 1 day ~ 3 day turn, 4-layer boards with 3 day ~ 5 day turn. We are experts in special boards, such as 3mil trace, 6mil hole, Rogers boards, ENEPIG finish, wirebonding, rigid-flex boards, etc. 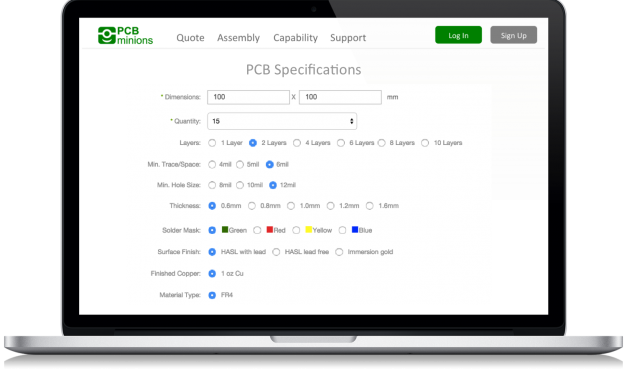 Enter your PCB specifications, such as dimensions, number of layers and color. We will provide an instant quote with different turn time options. Upload your design files in a zip file. We accept the following formats: Gerber file, and PROTEL/Altium *.PCBDOC. We accept all major credit cards and Paypal. Your receipt will be emailed momentarily. 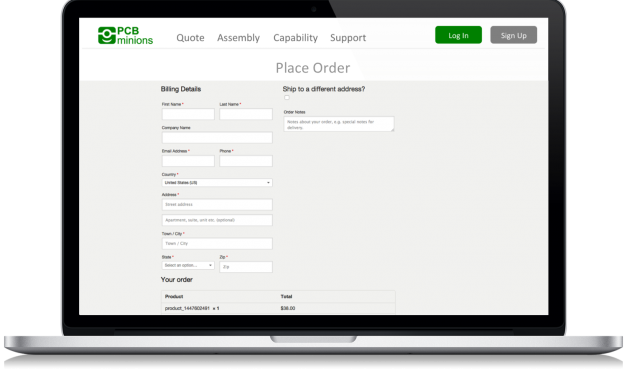 You will be notified when your boards get shipped with tracking number. We’ll keep the standard up. been using their service for all of my projects.